This proud department served the Town of Ross, California from 1908-July 1, 2012. ​It was merged into the Ross Valley Fire Protection District in 2012, which today also serves the Towns of Fairfax and San Anselmo. This is an introduction to the history of the department before the merger. We are sharing some very early history now, and plan on expanding the written portion and photographs in the near future. Start with the slide show below, and at the bottom see retired Chief Tom Valle's presentation to the Ross Historical Society on September 16, 2016. We give thanks and recognition to the Ross Historical Society and their Jose Moya Del Pino Library, to Roy Farrington Jones and his photo collection, and to retired Ross Fire Chief Tom Vallee for his presentation at the bottom of this page. Thanks also to Laurie Thompson and the Anne T. Kent California Room collection in the Marin County Free Library. This story includes additional newspaper research by William "Bill" Lellis, retired Chief of Larkspur, and was compiled by Tom Forster. The Town of Ross itself has roots into the 1800's, and is named after James Ross. For most of it's history, it has been an area with many affluent residents, located in the heart of the Ross Valley in Marin County. Only 1.6 square miles in size, Ross is beautiful and features some of the nicest weather in Marin. The Ross Fire Department dates back to 1908. The population was roughly 500 at the time. Following a series of fires, the Town embarked on selling bonds in 1909 to improve the community, including the creation of a fire department. Unusual for such a small community, they had several firsts in Marin County fire service history. 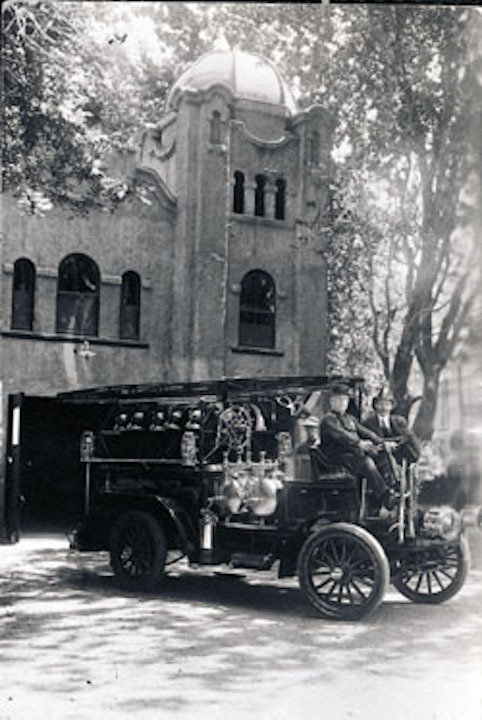 In addition to having the first known motorized fire apparatus in Marin County, a 1910 Seagrave Chemical Engine, they also employed one of the very first known paid fireman in the County, as explained below. Seagrave was founded by Fredric Seagrave in Detroit, Michigan in 1881. It is today the oldest continuous manufacturer of fire apparatus in the United States. The company moved to Columbus, Ohio in 1891 and remained there until 1963. Seagrave moved all operations to Clintonville, Wisconsin that year. FWD was founded in 1909 by Otto Zachow and William Besserdich in Clintonville, Wisconsin. It became a premier manufacturer of heavy truck chassis and produced America’s first all-wheel drive chassis. The two companies merged, and today, FWD Seagrave produces a range of custom fire apparatus including pumpers, pumper-tankers, rescue units, aerials, aerial quints, tractor-drawn aerials and platforms. Prepare to Install Modern Fire Fighting System [Special Dispatch to The Call] ROSS, Nov. 10.— The local board of town trustees is making rapid stride toward the installation of a. modern fire fighting system, the latest plan being to purchase an automobile, hose and chemical machine. 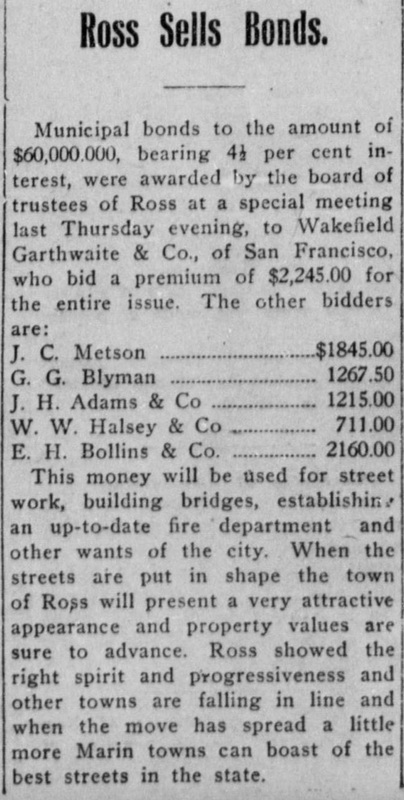 At the last meeting of the board, Trustee C. A. Meussdorffer was appointed a committee of one to investigate the cost of the proposed new apparatus, which will be capable of carrying 1,500 feet of hose. It is estimated that a machine will cost the town $7,500. The highways of the picturesque town are also being improved." "ROSS' FIRE FIGHTER RIDES AUTO ENGINE - Aristocratic Village Buys $5,500 Motor Fire Engine [Special Dispatch to The Call] ROSS. Nov. 2. John Martin, capitalist and clubman, has recognized the services of the local firemen in saving his home from fire recently by presenting the department with a chemical fire nozzle of considerable value. This morning the department received a $5,500 combination chemical and hose motor fire engine. Said to be the first of its kind on the coast. 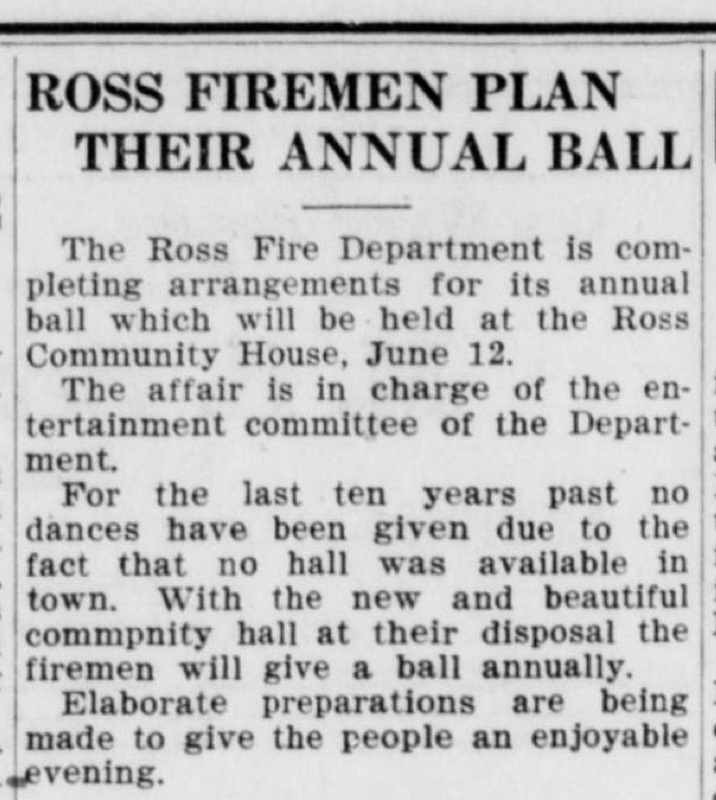 The residents of Ross, accustomed to the daily luxury of automobiles, insisted that the firemen should have an auto fire engine. The engineer who operates the new motor fire fighter is the only salaried man in the fire department." 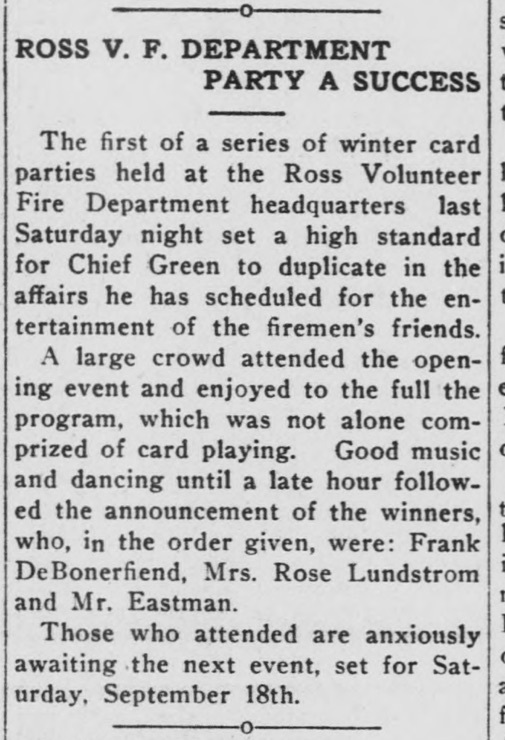 "Auto Fire Engine For Ross - Saturday the new automobile combined hose wagon and chemical englne passed through here on its way to Ross, where It will do duty. It is the gift of Mr. John Martin, the well known resident of Ross who never does anything by halves, to the Ross Volunteer Fire Department as a slight appreciation for the valuable work rendered when his green houses were on fire. Al Jewett, chief of the Sausalito Volunteer Fire Department, was deeply Impressed with its value and the generosity of Mr. Martin. He Is looking forward to the time when Sausalito will have one. The automobile is a whole fire department In Itself. It will carry 2000 feet of hose, a long extension ladder, besides hooks, short ladders, axes and lanterns and the full equipment IncludIng the chauffeur and firemen. The auto fire wagon took a run Into San Rafael on Sunday night, where it was the center of much attraction and admiration by all." In the Ross Historical Society book titled ​"Ross, California, The People, The Places, the History", on page 130, Bob Battersby writes that the town had a paid engineer by the name of J. A. Green, who lived in the main station at Lagunitas Road and Shady Lane. The engine was described as a Seagrave chemical and hose engine with two 40 gallon chemical tanks, 1200 feet of 2.5 inch hose and 200 feet of 1.5 inch hose. Sadly, the engine was involved in an June 5, 1911 tragedy where 12 Bay Area ministers took a ride on the engine. As the San Francisco Call reported, "Mrs. Carroll, wife of the Ross clergyman, was in front of the auto, standing in the roadway, when the accident happened. She saw the machine approaching and signaled the driver, J. A. Green, to stop, so that she could speak to her husband. The road through Shady Lane was in good condition and there were no embankments to be feared. The driver was running the car at a moderate rate of speed. As Mrs. Carroll held up her hand he applied the emergency brake. Without warning the heavy machine swerved to the right, crashed into a large elm tree and threw those who stood on the running boards and other parts of the auto to the ground." One minister died, one was gravely injured and several others sustained injuries." The next Ross engine purchased was a 1928 Mack. This unique pumper was one of only five of this type built. 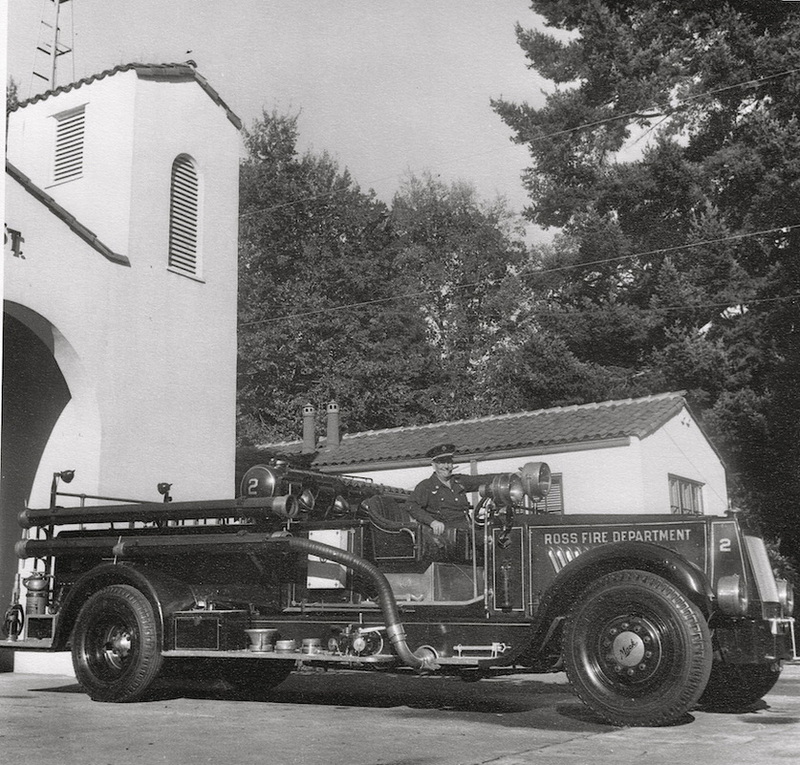 In 1929 it responded mutual aid to the great Mill Valley and Mt. Tamalpais fire, breaking down on the way. It was then towed to Mill Valley, and ended up pumping for about two weeks. The last Ross Fire Chief to serve, Tom Vallee, retired in 2012 when the FD merged into Ross Valley FPD. Chief Vallee gave a presentation on the history of the department hosted by the Ross Historical Society on September 16, 2016. Dan White and Ana Maria of Share-A-Vision productions produced and have shared this video below of Tom's talk. Special thanks to them for this volunteer effort on behalf of the Marin Fire History project, and to Tom for his presentation. ​To see the video in full screen, click on the symbol in the lower right between HD and vimeo. Ross Fire Chief A.J. 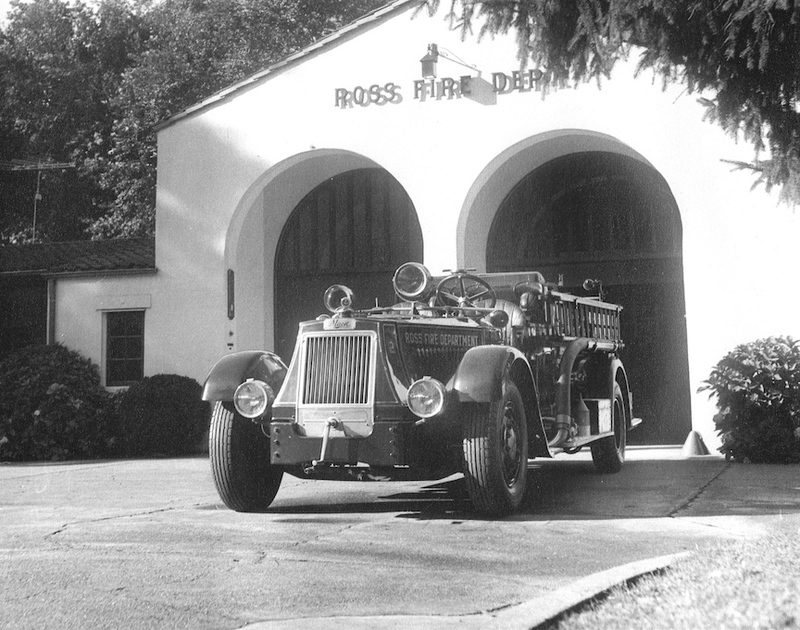 Heinrich in the 1928 Mack in front of the Ross fire station in 1962.